Jayapura, - The activities of the Purom Wenda group that continues to spread terror are inseparable from the presence of firearms they have. Even though civil society should not have firearms. With the firearm, Purom Wenda continued to spread terror and make people nervous. Therefore the authorities continued to hunt down Purom Wenda and continued to explore the firearms they used for the safety and security of the community. On Tuesday, finally the firearms that have been used by the Purom Wenda group can be identified. Almost all of the weapons used by the Purom Wenda group were owned by the TNI and Polri which were forcibly confiscated, ranging from the types of Arsenal, Minimini, AKM and assault rifles. 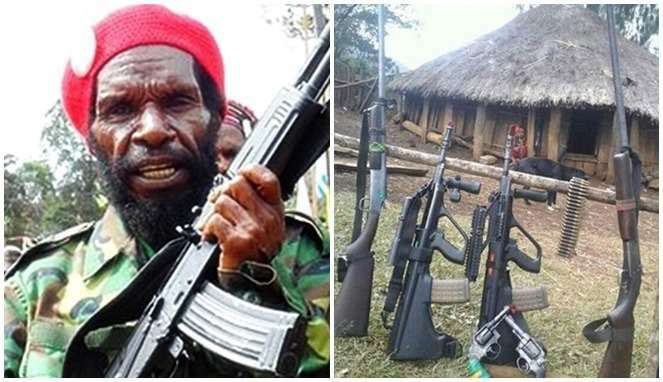 The Papua Regional Police Chief, Inspector General Martuani Sormin Siregar, revealed that the Armed Criminal Group (KKB) in Lanny Jaya numbered 40-60 people, some of whom had organic firearms, which they seized from the hands of the TNI and Polri. "So, they have automatic rifles, Minimi, Arsenal, AKM and assault rifles, which were seized from the hands of our men, whom they persecuted and killed," Martuani said, to reporters after meeting with press personnel in Jayapura City on Tuesday (11/13). He said, there were two machine guns seized from members of Brimob while serving in Puncak Jaya District several years ago. Whereas other weapons they possessed such as assault rifles were seized from Pirime Sub-District Police, Lanny Jaya Regency and Sinak District Police, Puncak Regency. "What is interesting from the results of our recent raids, there was a chain of 98 automatic weapons ammunition. The possibility of ammunition is left behind when we carry out law enforcement operations there. We believe they still have 60 items. Because our analysis results they have two chains, "he said. According to the former West Papua Regional Police Chief, Arsenal's weapons have a range of up to 800 meters, which is equipped with a type of large caliber ammunition. "So, now we are trying to take this weapon back from their hands, so that they will no longer disturb the community," he said. He also said that the KKB headquarters in Balingga were not far from the community settlement area. However, strategy and physical strength are needed to enter, because the area must climb three steep hills. "Yes, if you say the location of their headquarters is not far from Balingga. But, it takes one day to climb one hill. When using a helicopter it is certainly not possible to do it. Because of the high hill, there is no possibility that we can use helicopters, "he said. He said, after a motorcycle taxi driver died two weeks ago with a gunshot wound allegedly carried out by the KKB and also the shooting of a motorcycle taxi driver yesterday, (read: PUROM WENDA TEBAR TERORES AGAIN, TUKANG OJEK SHOTED) his side tried to enforce the law, so that the perpetrators could account his actions. It is known, after the shooting of motorcycle taxi drivers, Martuani led the law enforcement directly against the KKB in Lanny Jaya Regency. From the results of the gunfire of the authorities with the KKB group, as many as three people from this group were killed. At present, law enforcement efforts there continue to be carried out, in order to provide security for the people there.